Canadian buzz band Black Pistol Fire talk duo dynamics. 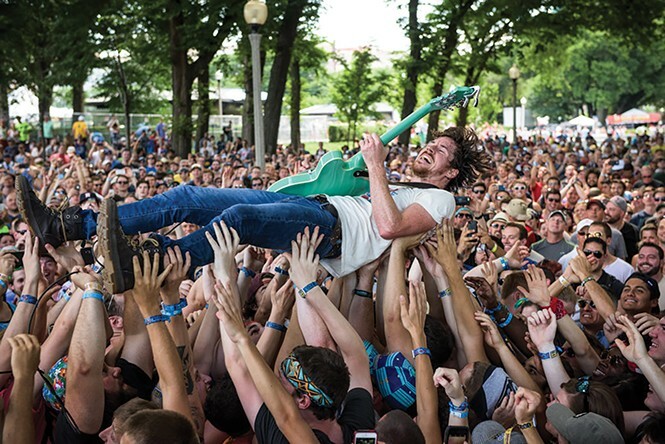 Plenty of bands like to party after a big show—but not Black Pistol Fire. That's because, according to drummer Eric Owen, the band uses every ounce of its energy on stage. "It really does take a lot out of us," he says. The Canadian rock duo's live shows are wild. At any given moment, frontman and guitarist Kevin McKeown is liable to leap off a stack of speakers, writhe around on the stage or surf the crowd, all while shredding white-hot rock 'n' roll. Owen, meanwhile, is a max-effort drummer who appears intent on demolishing his kit. "None of that is forced at all," Owen says. "That's how it makes us feel. The music makes me want to hit the drums as hard as I can; it makes Kevin thrash around and go crazy. That adrenaline rush is so huge." Black Pistol Fire is a new take on the long tradition of fast and filthy blues laid down by the likes of Led Zeppelin and Muddy Waters. As a two-piece, comparisons to The White Stripes and The Black Keys are often made. Black Pistol Fire definitely draws from the same toolbox—quiet-then-loud dynamics, guitar heroics and festival-leveling amplification—but with added dashes of Southern grit and fiery intensity thrown in. Speaking from his front porch in Austin, Texas, during a break in the band's tour promoting their fifth album, Deadbeat Graffiti (Rifle Bird), Owen explains that he and McKeown go way, way back—in fact, all the way to grade school in Toronto. "We went to kindergarten together," he says. "I was one of those kids that pulled their pants all the way down to their ankles to pee instead of just going through the fly, and my first memory of Kevin is him pointing and laughing at me while I was doing that." The two started playing music together in high school. For their first-ever performance, they played a shoddy cover of Marilyn Manson's version of the Eurythmics' "Sweet Dreams (Are Made of This)" for their class. For years, they jammed The Beatles, Nirvana and Weezer as a trio, playing with different bassists, and started making original music in their early 20s. "We started doing the duo thing because we always wrote songs like that," Owen explains, "and then we just started jamming and figuring out how that works. It wasn't a conscious decision to be a duo; it just kind of happened." The two have since discovered that the simplicity of being a twosome has its benefits. They use less gear, so less can go wrong during shows, and afterward they split the pay 50/50. Decision-making is relatively easy as well—either they're both on board, or they do something else—and so is the creative process, with McKeown acting as the driving force and Owen following along. With just two sets of hands and feet on stage, it can be tricky making enough noise. It helps to crank up the volume on Owen's kick drum to stadium-stomping status, and McKeown increasingly experiments with effects pedals to achieve massive guitar tones. Owen also chooses key moments to play low-end synthesizer lines with one hand while simultaneously keeping the beat going, adding a layer that makes up for the lack of bass guitar. Over the years, Owen has had a front-row seat watching McKeown evolve from a reserved performer to one of the most dynamic frontmen in modern rock. "As a teenager, Kevin was the craziest person ever," Owen says. "And I mean that in a funny and wild sort of way; he was always trying to make people laugh and doing crazy stunts. When we started playing music, people would come see us play and say, 'Wow, Kevin is shy on stage—that's not what I expected.' Slowly, the two sides of him kind of melded and that wild side of him has been harnessed on stage. He's gotten more comfortable as a frontman." Black Pistol Fire's attention-grabbing, high-energy shows have taken the two longtime friends pretty far—from covering Weezer in a basement to opening for them at a Colorado music festival. And they're still going strong. "It is very surreal," Owen says, "and I couldn't ask for a better person to do it with."